The friendly, modern Mayfair complex provides an excellent standard of accommodation in a location central to all facilities. A great choice for all ages whether families or couples. Fantastic holiday stayed two weeks from 22nd August.Best inclusive ever we have stayed.Staff excellent so polite; food excellent definitely 5 star.Cleanliness of hotel first class cleaners done excellent service.Activities during day excellent team done excellent job. Could have not faulted this hotel in anyway so good we have already booked for next year can't wait to see you all. Our family of 3 stayed in 2 rooms at the Mayfair from 7th to 21st July, and having read mixed reviews elsewhere, I was more than a little concerned. With that in mind, I shall try to split this review into sections, and report facts as much as possible. Check in: We arrived at the hotel just after 11pm. George on reception was business like & efficient, sorted out our keys & wristbands, told us the meal times & locations, and explained how to get to our rooms. Rooms:	Both rooms had a seating area (sofa beds) and a sleeping area (one of the rooms was arranged as a studio, the other as a one bedroom apartment ) a fridge, kettle & mugs, and a TV (not much in the way of English channels). The bathrooms both had a power shower over the bath. The whole room had a tiled floor and a balcony. One hotel had a pool & garden view from a small balcony, the other a street view from a bigger balcony. Meals: All meals are buffet service. Breakfast and dinner are served in the main restaurant, and lunch is served at the Gardens Pool bar. Breakfast had a number of choices, changing slightly every day - fresh bread, porridge, 4 different cereals, bacon or fried ham, frankfurters or British sausages, eggs in at least one form (fried, boiled, scrambled, omelette ) fried bread, mushrooms, croissants & Danish pastries. Tea, coffee, orange juice, pink grapefruit juice, water. Dinner is on a different theme every night Greek, International, European, Carvery, Farmers, Italian, etc. The menu is posted outside the dining room before breakfast, so you can see what it is on offer. Rather than try to list everything, I shall list the Carvery Menu from our last night: Leek & potato soup; roast pork and roast beef from the carvery; lamb boulangere; chef's pie; fillet of fish in mussels sauce; rice; pasta; roast potatoes; chips; buttered carrots; green beans with herbs; green salad; tomato salad; gravy; apple sauce. Desserts were a selection of creme caramel, mousse (usually 2 types) honeydew melon; watermelon; Rocky Road slices; cheesecake. Lunch is a simpler affair, with 3 salads, 1 fish dish, 2 meat dishes, spaghetti Bolognese, chips; fresh fruit. Snacks are available daily from 10:30 until 12, and 3:30 until 5, consisting of bread, ham cheese, salad, 2 hot dishes chips, calamari, sausages, burgers, etc and a sandwich toaster. Ice cream is available on a self-serve basis at mealtimes vanilla, strawberry & chocolate. Drinks on the all-inclusive: 2 draught beers (Leon & Kappa); ouzo; tequila; brandy; whisky, vodka; red wine; white wine; tea; coffee; hot chocolate; soft drinks from the gun, including diet coke; 4 cocktails are included, plus the "cocktail of the day" (sometimes this is one on the AI list, sometimes not) the cocktails included are " Cuba Libre, Tequila Sunrise, Ouzo Special, Brandy Sour, plus 3 children's cocktails). There are other drinks available at a cost Keo & Carlsberg cost 3.50, cocktails between 3.50 and 5, and frozen cocktails are 3.50. Milk shakes are 2.99. Staff are all friendly and willing to help. Once the evening entertainment begins, then waitress service starts in the bar area, so no need to queue, although sometimes you may need to wait a little longer if the bar is busy. The animation team work hard and are very popular with the majority of guests, and there is some "brought-in" entertainment, such as Lady Gaga & Michael Jackson tribute acts. There are 2 main pools, plus 2 kids pools. One pool is the activity pool, depth ranges from 0.7m to 1.7m. The quiet pool has no activities taking place, and ranges from 1.7m to 2.2m. The kids pools are 0.7m deep. I have tried to keep my opinions out of the review, but I was pleasantly surprised by the hotel, which I feel offers great value for money. I would definitely consider returning. Lovely pools, good entertainment, very varied from family games to local acts and bingo every night with huge jackpots!! Tasty food, there was always something you could find. Apartments are very basic but very clean. Only fault is that it is too far from the beach about a half hour walk and the nearest beach isn't that great. There is a bus service for 150 euro each way. We took two 17 year olds and an 18 month old and we all had a fabulous time!!! We are sad to be home. Wasn't happy when we landed with our transfers as we had to wait approximately 1 hour for other flights to land to then get on our transfer shuttle (run down bus which didn't sound very safe). The accommodation was lovely, very nice staff and service. We were able to keep on our room for a few more hours on the last day which we found very helpful and useful. Entertainment team did a fantastic job and the entertainment that was on was very entertaining especially rock the room and the burlesque dancers. Lots of choices for food in the morning and at night but least looked forward to lunch as wasn't really much choice. The staff at the mayfair all worked very hard and delivered a great service. We went with our 14 year old daughter and her friend. We read reports before we left and had mixed views but when we arrived at the hotel it was lovely. We checked in and went to our room which was clean and air conditioned, we had only been there one day and had our towels changed and room cleaned this carried on through the holiday. 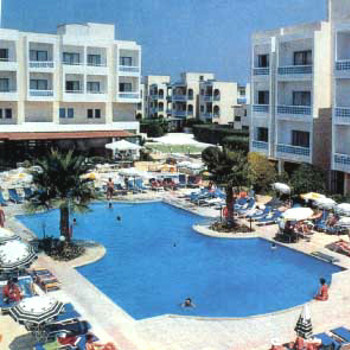 The food was lovely, the hotel staff were lovely and friendly, the hotel pool area was clean so we had a fantastic holiday and would recommend this hotel to anyone. We are very fussy however my daughter and her friend had a lovely time with organized activity's throughout the day. Paphos is beautiful, the harbor and the old town is a must to see. We absolutely love this hotel. We thought the room was a bit dated when we first arrived but it was clean so it was OK. The staff of the Mayfair are probably the friendliest and most helpful that I've ever encountered on my travels, especially Angela who spent a lot of time talking to the Grandchildren and helping them. The entertainments team were also a cut above, they worked their socks off from morning till VERY late at night and deserve a medal (be careful when they do their 'busy bee, busy bee' routine, you may get a shock!). I'd reccommend this Hotel to anyone but, perhaps, if you are expecting five star luxury at rock bottom prices you won't like it. We stayed in a studio apartment,which was next to the childrens pool which closed at 7pm so no problem with noise at night. The apartment needed updating,fridge was rusty,small 2 ring electric cooker on top of a unit we were afraid to use it in case it burnt the cupboard above it. It said beds were changed 2/3 times a week, ours were not changed at all,towels changes everyday ours were changed twice. The staff we saw were all very pleasant.Don't know about the food as we ate out every night.It's a 20 minute walk down to Pathos and the harbour area, but very pleasant passing the ruins ect.The entertainment staff were on the go all the time.It would be very noisy at night if you had a room above the bar area as this is where the entertainment was till 11pm. We would't stay at this hotel again as it was a bit to far from the main area. this is the second time we have stopped at this hotel and yet again it was faultless, cannot comment on the hotel food as we were self catering we ate somewhere different every night in the town, but talking to people around the pool the food was excellent.the location of the hotel is about 15 minutes from all the bars and restaurants although there is a handful near the hotel would recommend the full moon.the day time for entertainment around the pool was excellent and it kept our 2 kids ammused for the 2 weeks.